Here’s something you probably didn’t know: The McLaren-Honda Formula One team isn’t great these days. Wild, right? 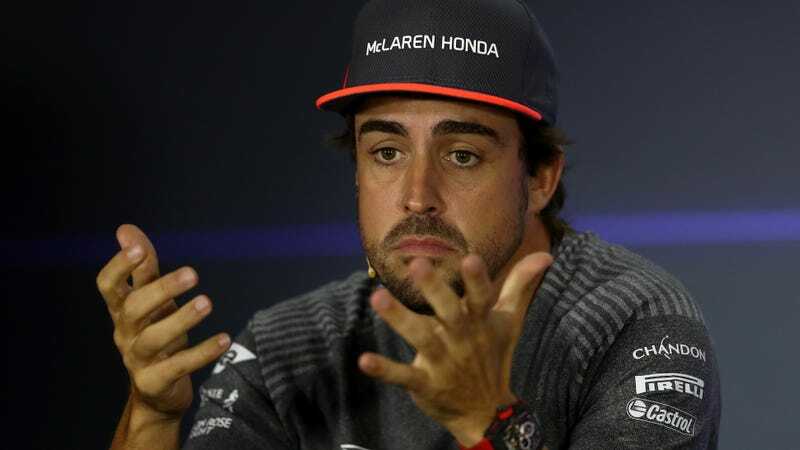 The team’s two-time champ, Fernando Alonso, has threatened to leave all year in the same vein as a teenager saying they’ll never talk to you again, and he’s still not sure if he’ll stay around. Alonso’s had a lot of opinions about the McLaren team during his time there, this year especially. He said back in June that he’d leave the team if it didn’t start winning races by September—hm, guess that one didn’t happen—and it became a battle of “It’s me or the engine” when McLaren still hadn’t made a decision to drop its awful Honda power unit. Well, McLaren did the dang thing (the second one, not the “winning races” part). The team will run a slightly less bad Renault engine for the 2018 race season, but Alonso’s still keeping us guessing—on everything but whether he’ll go to the Verizon IndyCar Series next year. Following the McLaren-Honda split, it has been expected that Alonso will stay at the newly Renault-powered British Formula 1 team next year. However, Alonso’s self-imposed September contract deadline has long expired. A second self-imposed deadline of “before Austin” is fast approaching. Since Alonso’s Indianapolis 500 run this year, which went from “Wow, this dude could win” to “Should’ve known that would be his luck” when his Honda engine gave out, the Alonso-to-IndyCar storyline has been a big one. “As I have said several times, one of my goals is to be the best driver in the world, the most complete in the world, and for that I still believe you have to win in other categories, too, and especially the ‘Triple Crown,’” said Alonso, referring to the Monaco Grand Prix, Indianapolis 500 and the 24 Hours of Le Mans. “That is one of my goals. Whether or not Alonso wants to challenge himself with a Renault engine, well, we’ll find out soon. Maybe. Or maybe he’ll just set another decision “deadline” for next month. He’ll have to decide before the next race season, at least.